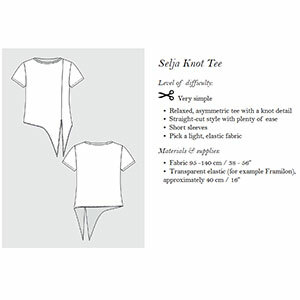 The Selja Tee is a relaxed, asymmetric tee with a knot detail. It features a straight-cut style with plenty of ease and short sleeves. Suggested fabrics are light weight fabrics with good stretch such as cotton jersey, cotton lycra or jersey rayon.